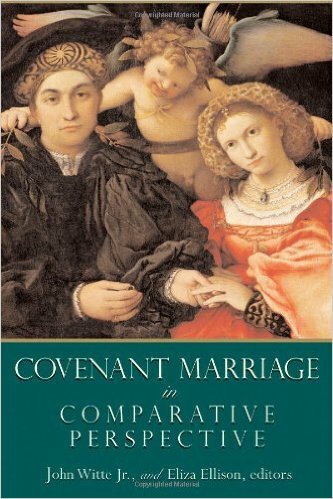 Book: Covenant Marriage in Comparative Perspective - John Witte, Jr.
Covenant marriages requiring premarital counseling and tighter strictures on divorce have recently emerged in some American states. At the same time, the doctrine of covenant has reemerged in religious circles as a common way to map the spiritual dimensions of marriage. Covenant Marriage in Comparative Perspective brings together eminent scholars from Jewish, Orthodox, Catholic, Protestant, and Islamic religious traditions as well as experts on American covenant marriage. The introduction carries out an unprecedented comparison of contract and covenant in Jewish, Christian, and Muslim understandings of marriage. The rest of the book elucidates various facets of marriage from the perspectives of both jurisprudence and religion, producing an enlightening integrated picture of the legal and spiritual dimensions of marriage. "A really important book on what is arguably America's most significant problem. A strong society depends on loving and lasting marriages to provide for many of the needs of both its adults and its children, but we Americans have not yet figured out how to foster such marriages. This book explores the possibility of invoking in American law the concept of marriage as covenant embedded in all three Western religions and now an option in some states, and it does so from varying legal and religious perspectives and with thoughtful arguments pro and con. No book could be more timely or important for our personal lives and our society as a whole."